This is Mac & Cheese’s sophisticated cousin, and it’s dead simple to make. A tblsp. of olive oil in a cold pan, crank up the heat to medium-high and cook 2 minced garlic cloves for about 60 seconds (over cooked garlic gets bitter). Next add the zest of 2 lemons, the juice of 2 lemons (I strained out the pulp), 2 cups heavy cream, 2 tsp. Kosher salt and 1 tsp. black pepper. Bring to boil, reduce heat and simmer for 15 minutes. It will (should) thicken. Boil your pasta (we used Fusilli, 1 lb. ), and prep your veggies while it cooks. I sliced a pint of grape tomatoes and cut a lemon into cubes. I also gather about 2 handfuls of baby arugula. Drain the pasta and add it to a big bowl. 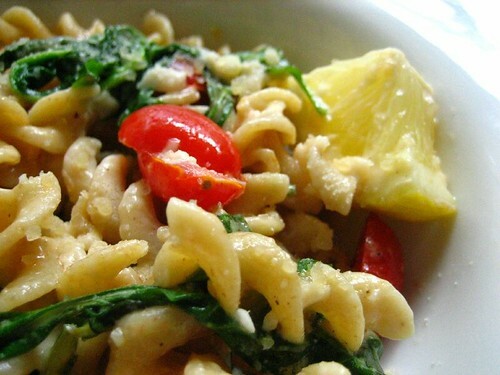 Pour over the cream sauce, and toss together the toms, arugula, lemons chunks, and some Parmesan cheese to taste.